Super Mario kart, the first Mario console game, launched in 1992. Firstly i can see that the game has no pull up HUD, just an action HUD and a permanent HUD, it gets, the action HUD come up when the race is about to start, the green light. The game consists of a few different permanent HUDS, such as the position you’re in, the time, and your coins you’ve collected throughout. 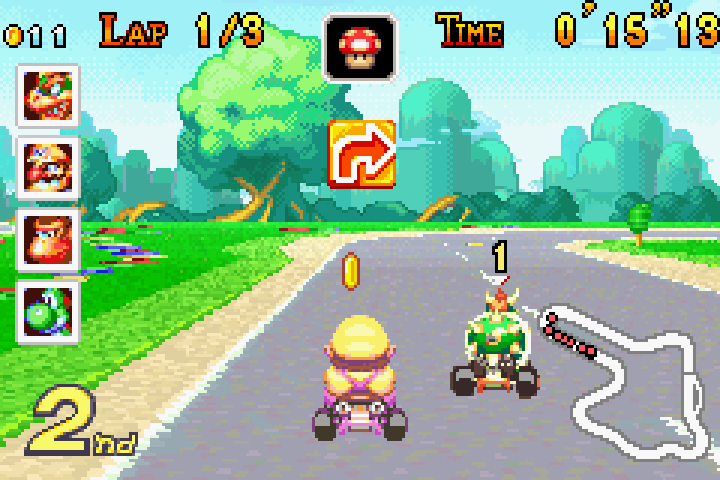 Furthermore, the graphics for super Mario kart were only 16bit, and it only had a few colours. 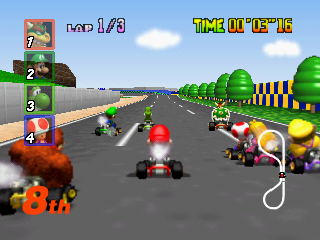 Mario kart 64, this next game of Mario kart was launched in 1996.One change i can suddenly see is the change in the graphics, which are now 3d, and has 64bit graphics now. However the HUDS didn’t change too much but, the mini map, which locates where you are around the track, it also has a image of the top 4 characters on the track, which is also a permanent HUD. Mario kart: super circuit, this was launched in 2001. The first thing i notice are the graphics, of 32bit, as this game was on the gameboy advance.There is also little change with the HUDS, such as the indicator when you come up near a corner, that tells you where to turn. this is an action HUD. Another different HUD, is the item box located at the top middle, which shows you an item you obtain throughout your race, this is an action HUD as it only comes up when you do something in game, in this case picking it up on track as you go. 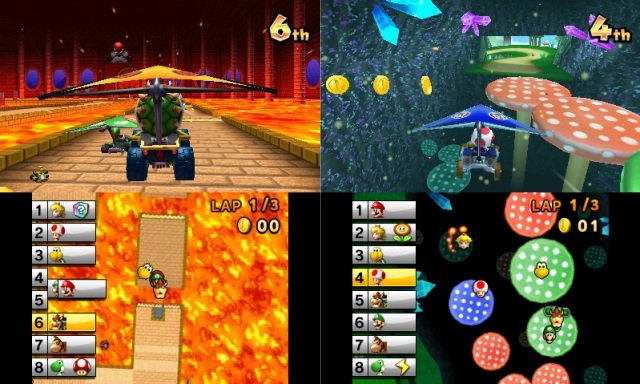 Mario kart: double dash, this was launched in 2003, for the Gamecube, something new with this game, is that it now allowed you to play co-op, such as one of the players can control the kart and the other can control on using the items they collect. Another difference is that each of the 20 characters to select from had an item of their own. I can also see a slight change in the HUDS, such as now it has a speedometer. The graphics have also been developed a huge amount, along with the frames per second. 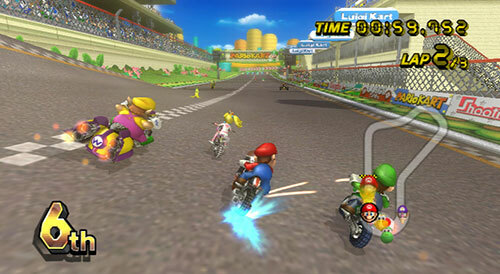 Mario kart DS, this was launched in 2005, the first version of the game to introduce an online service, for players to try and beat each others scores. Other than that there not too many differences, mainly just the other screen which locates you and the other layers positions, along with the time. Mario kart: wii, this version of Mario kart was published in 2008, the big difference with this Mario kart is the focus on multiplayer.other than that there is not too much difference but character modifications, that give some players slight advantage over others. Mario kart 7, published in 2011. With a new element of the game, to be able to drive underwater, and the ability to customise vehicles fully. Next postAssignment-architecture in London posters- evaluation and research.